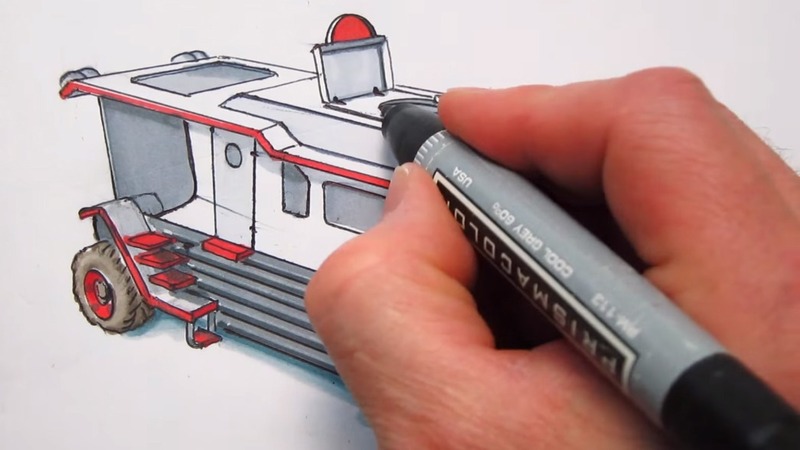 Rendering out new product design concepts with markers can be a pretty daunting task. In my new multi-part series I look at how to approach rendering adventure toy concepts, combining old school marker techniques with some modern day digital photo editing techniques. Overall, this series will showcase some advanced skills used by industrial designers when they render out concepts to present to a client or for review in the product design process. We’ll start with the design process I follow to design and refine the concept into final marker renderings. Part One includes three episodes that tackle conceptualizing a modern day ‘Amphibious Globetrotting Vehicle’ (AGV) called the RedJack. It’s an adventure RV, designed to be a free-play exploring toy for children. Marker renderings are great for presentation of concept art and I’ll be using a mix of Prismsacolor and Copic markers, Micron Pens, Prismacolor colored pencils and various other visual communication techniques including digital manipulation. The first episode of the Adventure Toy Rendering series covers “thumbnailing”. This is the art of creating postage size sketches to quickly work out a concepts and ideas. The second episode deals with a basic overview of creating a dramatic front view marker illustration of the RedJack AGV. We go over basic lighting, wheels, materials, value and shadows. The third episode deals specifically with the construction of an underlay for a rear ¾ top down view of the RedJack AGV. This is the foundation to any good Illustration. It includes how to do a basic layout of the vehicle, by drawing it inside of a box and making sure the perspective is correct before you start to lay down your color. Stay tuned for Part II of the series where we’ll explore more rendering techniques. Subscribe to my Youtube channel here and follow me on twitter @botzendesign.